When you log into OnCourse this is the first page you will see. Descriptions of what you see (or will see) are listed below. Conversations (this is where you will view the messages you write to faculty/staff/advisors in addition to those you receive from faculty/staff. This includes both READ and UNREAD messages. The envelope icon at the top of the page displays a number of how many UNREAD messages you have in your messages. Calendar – this is where you will see a calendar view of your course schedule and scheduled appointments with units using the appointment feature. All appointments currently happening through OnCourse are through SASSO, ODI, Dennis Learning Center, Newark, and Lima. You will be notified by your academic advising unit when they begin using OnCourse for appointments. 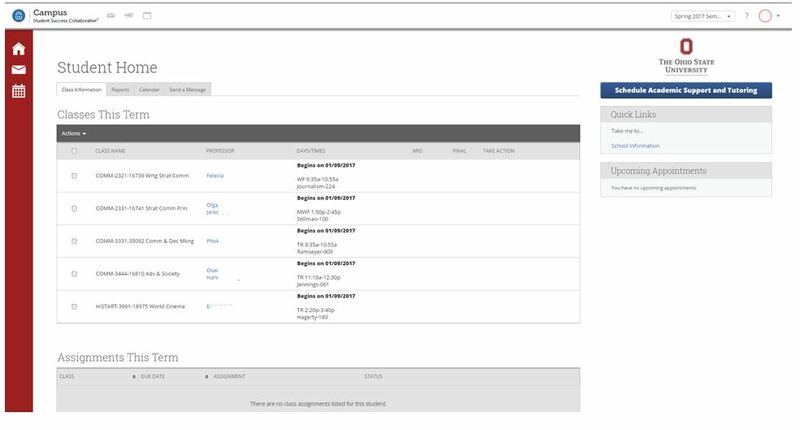 You can view a brief video about how to schedule an advising appointment using OnCourse here: https://www.screencast.com/t/DTuD8Z259tF. Reports Tab -what you see varies on what services you have used. For example, you might not have tutor reports or progress results, but you will have advising summaries. Calendar Tab – already described under “Red menu.” It is just another way to get your class schedule. Send a Message – you can send a message through OnCourse to assigned advisors and professors. Classes this Term – courses for current (or next term). You may go under Actions to send a message to all of the instructors associated with each course (if two are associated to one, it will send to both). Assignments this Term – nobody is using this feature at this time, so you will not have anything listed here. Schedule Academic Support and Tutoring – the place to schedule appointments for active locations you will have access to. This will not be widely used in the beginning. You will see locations populated as they begin to use OnCourse for appointments. You may schedule appointments with your academic advisor by clicking on the blue “Schedule Academic Advising” button above. Quick Links – clicking on School Information will take you to a list of all advising offices on campus. By selecting the office you would like to contact, you will be directed to a page that has information about how a student may schedule an appointment with an advisor in that office.